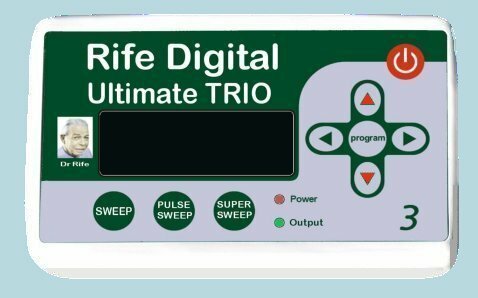 Rife Digital Ultimate Trio provides this Powerful Rife in a User-Friendly package. Multiple frequency programs can be selected from the Electro Therapy Device Frequency List (ETDFL) book which lists over 3500 diseases that can be treated with the ‘Ultimate’. HOW DOES RIFE DIGITAL TRIO WORK? The Rife Trio is a 16v, electronic device producing an adjustable frequency of 000.01Khz – 999.99Khz. This is the most successful bandwidth for eliminating bacteria and parasites through the hand and/or foot strap terminals. The pulsing action of the positive terminal sends an electronic “wave” through the body, which eliminates all parasites, bacteria, amoeba and viruses that live within this 1,000,000 Hz band. This positive current detaches the negatively charged bacteria from their electro-magnetic adhesion in the body, so that the immune system can fight them. The frequencies are programmed according to your particular illness. WHO INVENTED THE RIFE MACHINE? Dr Royal Rife Invented the original Rife Machine. The Rife Trio is a hand held version of the original Rife Machine, and has the power and sophistication of the original Rife to reproduce all the Rife Healing frequencies found in the original device. If you are looking for a more advanced model then check out our Rife Digital Professional V2 with dozens of built in groups and special sweep modes unavailable on RIFE TRIO.